Earlier this week on #GivingTuesday, JetBlue flew 100 do-gooders to Destination Good – the Dominican Republic – to partake in four days of community service. 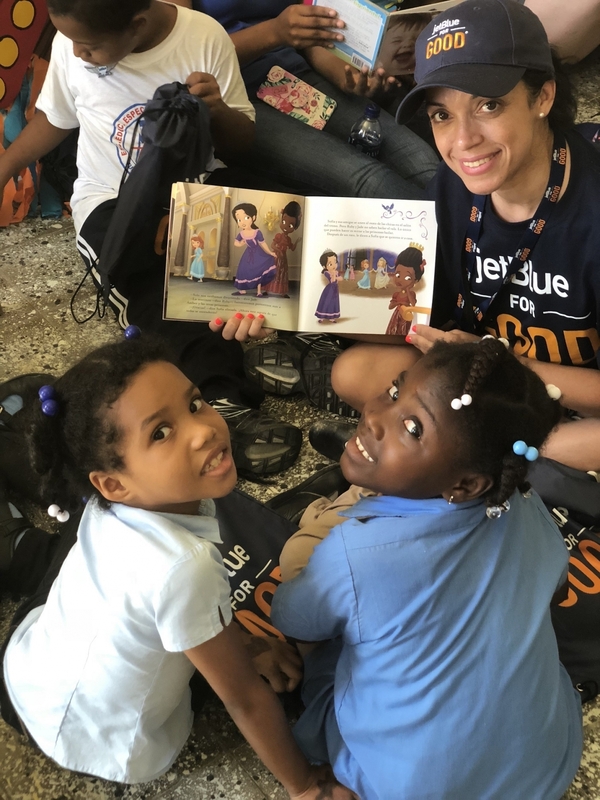 Winners of JetBlue’s #CheckInForGood contest participated in volunteer projects alongside some of JetBlue’s crewmembers and non-profit partners in La Romana and Punta Cana. Projects were aligned with JetBlue For Good’s youth and education, community and the environment pillars. "Since I’ve been here, I feel like I’ve made an impact in a way that’s genuine and respectful. That’s something I was personally mindful of -- coming to someone else’s country. This is an experience for us, but this is everyday life for the people we are with. I feel very grateful," said Nexus Cook, one of JetBlue’s #CheckInForGood winning volunteers. Partners for the Destination Good trip included the DREAM Project, Paradisus corporate social responsibility and Fundemar. All-inclusive accommodations for Destination Good volunteers in the Dominican Republic were provided by Paradisus Palma Real Resort in Punta Cana. Community Connection – JetBlue crewmembers gave back to a variety of causes and nonprofits throughout JetBlue’s 100+ cities in the U.S., Latin America and Caribbean and logged more than 5,000 volunteer hours in November. #CheckInForGood – As a precursor to JetBlue For Good Month, the mission-driven airline launched its second #CheckInForGood contest in October, inviting U.S. customers to enter for the chance to roll up their sleeves and volunteer with JetBlue and its non-profit partners in Destination Good – an undisclosed mystery location later revealed as the Dominican Republic. The contest received more than 40,000 entries from customers who were eager to join JetBlue in doing good. New JetBlue For Good Livery – JetBlue took its mission of Inspiring Humanity® to new heights with its aircraft dedicated to good. Destination Good volunteers arrived at New York’s JFK International Airport and were surprised with the reveal of the location just moments before boarding JetBlue’s newest special livery. 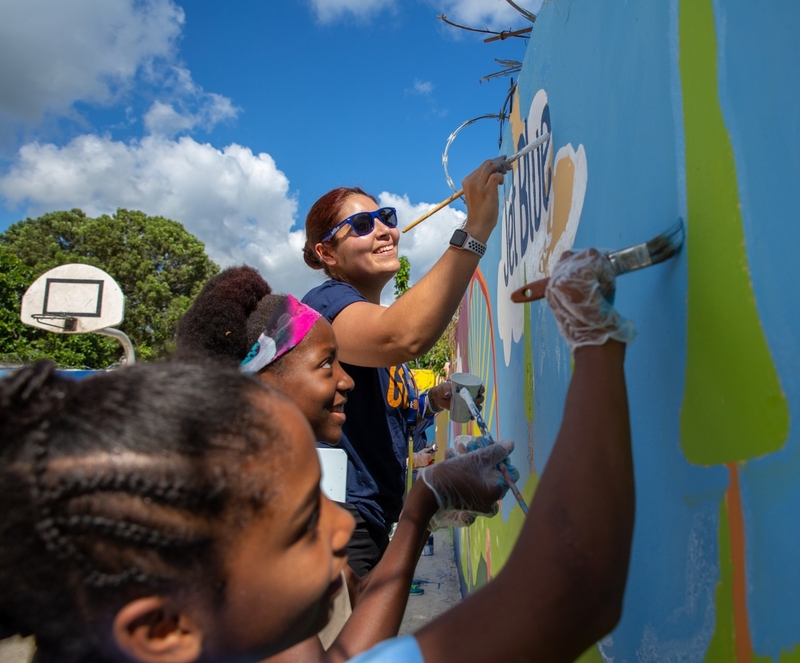 The JetBlue For Good plane celebrates the hundreds of thousands of hours crewmembers have dedicated to giving back and was designed to inspire customers and crewmembers to think about what they can do to make their community a better place. The livery depicts crewmembers peeling back a curtain to reveal an array of illustrations symbolizing the airline’s unique culture and causes JetBlue customers and crewmember are passionate about. JetBlue For Good Grants – To kick-off JetBlue For Good Month, JetBlue announced a contest for nonprofits to enter for a chance to win $25,000 to continue their good work. More than 5,300 entries were received and JetBlue selected three charities aligned with JetBlue For Good’s pillars. JetBlue provided $75,000 in grants to Behind the Book in New York City; Detroit Public Safety Foundation’s Sisterhood: No Boundaries Program; and Heal The Planet in Fort Lauderdale. World Kindness Day – On this day celebrating the best of humanity, crewmembers in JetBlue’s focus cities joined forces to spread some kindness. More than 200 customers and crewmembers in New York and Boston helped decorate and assemble 750 “sweet case” suitcases for children in the foster care system. Crewmembers in south Florida hosted a food drive for neighbors in need, while crewmembers in San Juan, Puerto Rico handed out special JetBlue For Good gift bags, and happy Kindness Day cards to customers. Also as a surprise and delight, JetBlue handed out more than 2,000 kindness goodie bags. Swing For Good Funds Distributed to Three Youth-Focused Charities – JetBlue distributed $1 million to three youth and education-focused charities. Funds were raised in October by JetBlue’s business partners, customers and crewmembers through the airline’s annual Swing For Good Golf Classic and Bid For Good online auction. Grants were provided to Feeding Children Everywhere, Together We Rise and the JetBlue Foundation. Since 2008, JetBlue's Swing for Good initiative has raised nearly $7 million to benefit charities. Encouraging STEM Education – The airline partnered with the Florida Panthers to celebrate students enrolled in the EverFi Future Goals STEM (science, technology, engineering and math) Program. JetBlue also sponsored the “STEM Matters NYC Career Day” for NYC public high school students interested in STEM career opportunities. The JetBlue Foundation, JetBlue Equals, as well as the airline’s Women in Flight crewmember resource group also hosted more than 60 girls for the first-ever Fly Like a Girl event in Orlando to introduce local girls to careers in aviation. 100x35JetBlue Supporting Long-Term Recovery in the Caribbean – The JetBlue Foundation provided $135,000 in grants and in-kind support to STEM initiatives helping to power recovery in Puerto Rico including Ciencia Puerto Rico, EcoExploratorio, Inter American University of Puerto Rico and the Puerto Rico Aviation Maintenance Institute. Helping Communities in Need – JetBlue activated its Community Relief and Recovery Fund to support customers and crewmembers during the California wildfires. Proceeds will benefit Americares and the American Red Cross. JetBlue also provided the California Fire Foundation with an immediate grant to purchase community necessities. Want to get in on the good? – If you’d like to join JetBlue in doing good, TrueBlue loyalty members can donate points to a variety of charities and causes through the TrueBlue Points Donation Platform. Join JetBlue in supporting causes and nonprofits such as DoSomething.org, KaBOOM!, the JetBlue Foundation and Make-A-Wish. When members donate points, they go directly to the selected charity, and each charity may use the points for travel for their organization. For example, since 2012 JetBlue has donated more than 23 million TrueBlue points to Make-A-Wish to help create live-changing wishes for children battling critical illnesses. For more information or to donate points visit jetblue.com/donate. 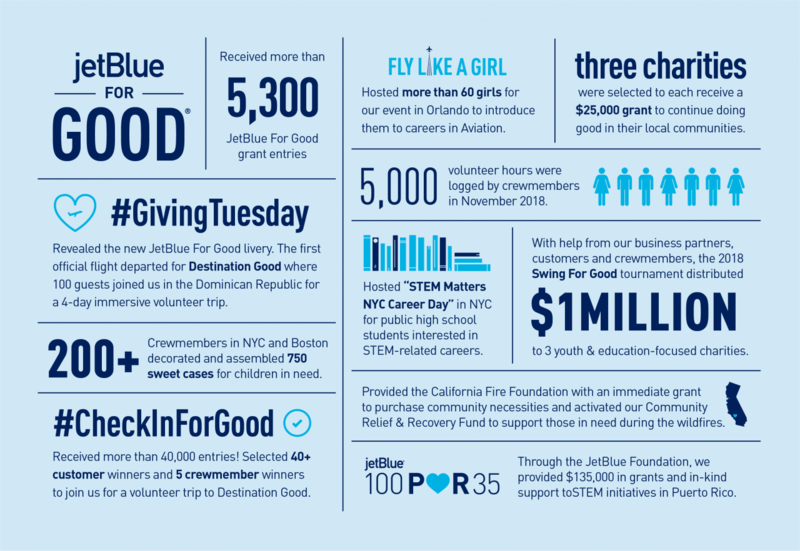 JetBlue For Good -- JetBlue’s platform for social impact and corporate responsibility. Giving back is part of JetBlue’s DNA and is core to its mission of inspiring humanity. Centered around volunteerism and service, JetBlue For Good focuses on the areas that are most important to the airline’s customers and crewmembers - Community, Youth/Education and the Environment. JetBlue’s core programs and partnerships directly impact the areas where its customers and crewmembers live and work by enhancing education and providing access to those that are traditionally underserved. Signature programs include the award-winning Soar with Reading initiative which has provided more than $3.1 million worth of books to kids who need them most; Blue Horizons For Autism which helps introduce air travel in a realistic environment to families and children affected by autism; and Swing For Good which raises funds for education and youth focused non-profits. Join the #JetBlueForGood conversation on Twitter, Instagram and Facebook.